Well After Last weeks disaster of a dig in Wilmington we decided to give Baltimore a try again. Earlier in the week wile driving through town I spotted 2 freshly demolished Houses on East Pratt Street. Forms were being put in by a construction crew to pour new foundations to build on. However the back yards were pretty well clear just some boards and other trash laying around. The houses on either side of this small site were probably built around 1850. We showed up about 10:00 Sunday morning cause none of us are morning people. We cracked open the concrete in the back corner were it was sinking over the privy and started to dig. We quickly found the wall of the pit it was going to be a large square wood liner. These can be pretty good on this side of town. Well it was hard digging thick clay mixed with bricks add to that a cast iron toilet pipe running through the top of the hole just added to our frustration. 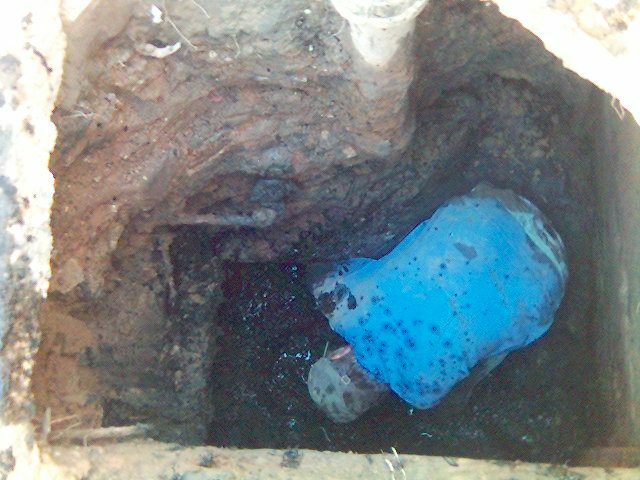 We decided that we should just dig half of the pit down and try to hit the trash layer and leave the pipe and clay in the other side of the pit in place. 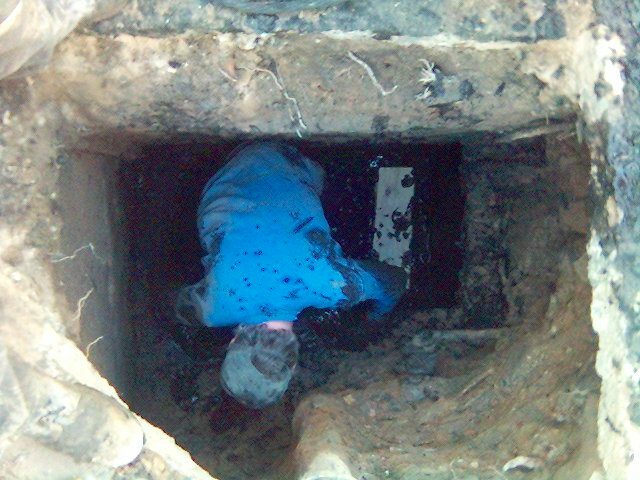 We we were down about 4 feet into the hole when we hit a wooden floor we all said this can't be the bottom so we pulled up the floor and right under it was a nice mucky black trash layer that had some 1860s flasks broken right there. I stuck the probe in this and it showed that we had about 4 feet of layer and it felt pretty trashy. I pulled out half the wooden floor and left the other half to support the clay and bricks from the other side of the pit so we wouldn't have to dig the rest of that crap out. The hole was very wet so I let Doug get into the hole he loves to get muddy I should have took a picture of him after we finished. Doug started taking this half of the trash layer down to the bottom. Every bucket of black muck was loaded with 1860s era shards. 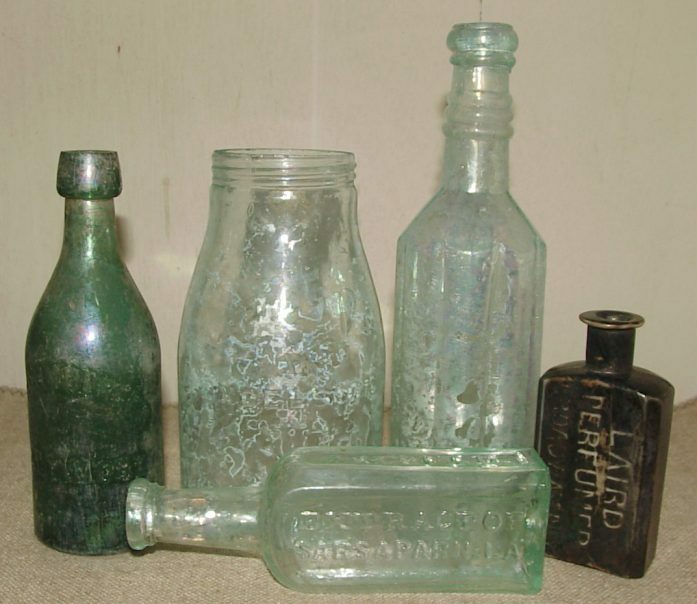 The first intact bottle was a Very rare Excelsior fruit jar from Philadelphia. The next good bottle was a teal green C. Hohnberger Baltimore squat soda. Then out cam a couple broken historical flasks. Then on bottom was a nice pontiled A.H. Bulls Extract Of Sarsaparilla from Hartford Connecticut. after he took this half down to bottom he strated extracting the layer under the wood floor several more broken jars came out and then a nice peppersause and another pontiled bulls and a small hand gun although it was pretty corroded. There was also several common embossed pontiled bottles like spauldings glue and Davis pain killer and a bunch of pontiled puffs. Overall it was a great loaded privy.